We have now come to the amazing prophecy of Daniel chapter 2. I would urge those that haven't read our discussion on Daniel chapter 1 to click here and read that before proceeding with this Daniel 2 commentary. The prophecy about the statue that King Nebuchadnezzar of Babylon dreamt is perhaps the simplest prophecy to understand in the bible. 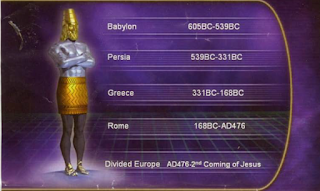 More than 2500 years ago God revealed to Nebuchadnezzar the history of the world from that time to the coming of Christ. The dream presented successive world powers that were to dominate world affairs down to the coming of Christ. It is really a very powerful prophecy that has enhanced my belief in God and I know it will strengthen your faith too. God revealed this to the pagan king Nebuchadnezzar through a dream. Unfortunately the king forgot the dream and this troubled his soul. King Nebuchadnezzar called his wise men and asked them to tell him of the dream that he had dreamt and its interpretation. The wise men of Babylon told him that they could only tell him the interpretation of the dream if he told them the dream. The king could not buy their argument and told him that unless they reminded him of the dream he had dreamt and its interpretation they would all be killed. The stakes were really that high. The lives of the wise men of Babylon were only saved by the intervention of Daniel who even though was one of the wise men of Babylon had not been present at that meeting. He asked the one charged with executing the kings orders to be given time. Daniel goes home and together with his friends plead with the God of heaven to reveal to them the dream that Nebuchadnezzar had dreamt. In answer to their prayer God reveals to Daniel the dream in a night vision. Daniel goes before the king and reveals the dream and its interpretation. This dream interpretation by Daniel 500 years before the birth of Christ unfolds the history of the world from his time to today. This prophecy has been fulfilled accurately to this very day. 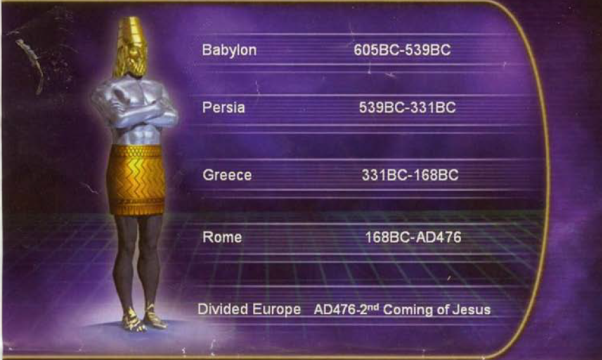 All the kingdoms presented in the image have come and gone as foretold by the prophecy that was interpreted by Daniel. How could Daniel without supernatural intervention present the history of the world spanning hundreds of years? This must definitely be something that is supernatural. We cannot explain it any other way. No one has so clearly foretold the history of the world in such a manner. Clifford Goldstein presents it better in his article in Adventist Review titled Revisiting Daniel 2. "This is not some flighty ethereal phenomenon—the supposed appearances of the virgin Mary—to suggestible adolescents, or the magic spectacles reported to have enabled the translation of the Book of Mormon. We’re talking, instead, about reality as firm, as public, and as unchanging as world history. What firmer, broader, and more immutable foundation—the history of the world itself—could God have used to build for us an edifice of faith?" The following illustration presents the statute that King Nebuchadnezzar dreamt and also the interpretation based on Daniel explanation of this dream and vision. I conclude this discussion with the words of Clifford Goldstein. "Yes, I still remember my first Bible study ever—Daniel 2. That was nearly 30 years ago, which seems so far in the past, but is a single breath in contrast to the long, windswept span of history depicted in the prophecy. And yet, what are all these millennia compared to what God has for us? His kingdom “shall never be destroyed: and the kingdom shall not be left to other people, but it shall break in pieces and consume all these kingdoms, and it shall stand for ever” (Dan. 2:44). That’s the promise, the reassuring promise of this final kingdom. And because Daniel was so right about the first four, how reasonable—how rational—to trust him on this, the last kingdom, the fifth one, which lasts forever." Please find below two videos as seen on 3ABN that go through this prophecy of Daniel chapter 2.